Senior League strugglers Asfordby FC claimed another point on Saturday as they were held to their second successive goalless draw at Hoby Road. 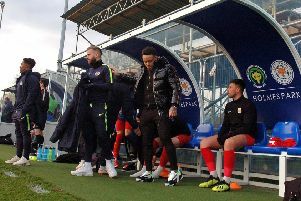 The match saw new boss Lee Mann face a swift reunion with his former club Sileby Town, having served there as assistant manager before his move to Asfordby last month. Having had the better of a 0-0 draw with second-placed Saffron on his debut, and then overseen a 5-3 defeat at Hathern, Asfordby’s defence regained its discipline to earn another goalless draw. Despite the scoreline, it was another entertaining game with great attacking and plentiful chances, only denied by good defending and goalkeeping. The point was good enough to lift Asfordby off the bottom of the Premier Division, on goal difference, from Kirby Muxloe Reserves. But Mann will be eager to land his first win as soon as possible. Next up is Saturday’s trip to Friar Lane and Epworth who sit just two places higher. Kick-off is 3pm. Asfordby: S. Abbott, J. Aldridge, J. Baker, L. Chapman, K. Clayton, B. Lapworth, L. Levirouton, A. Palfreyman, A. Ridout, L. Spencer, A. Wright. Subs: J. Withers, S. Wright.